Dad’s, at least the Dad’s of my generation, had two jobs- Earn an Income and Make Pancakes on Sunday Night for Mom’s night off. The first we knew represented his RESPONSIBILITY to his family. The second we knew represented his LOVE for our mother and for us. There never seemed anything we could do to repay him. There wasn’t a tie nor trip nor lighter nor ballgame ticket which could ever- EVER- be as valuable as what he gave and sacrificed and provided for our welfare, spirit and education. And so maybe we stop trying. We give up on the gifts and just purchase a card. Or maybe we continue to maniacally hunt down JUST THE RIGHT THING, in a blind, ambitious desire to give him something that comes close to saying Thank You. What Dad was doing was not only loving and nurturing his wife and his family. He was passing down years of learned respect and responsibility, he was educating us on what Fatherhood really means, he was mentoring and coaching a future generation to prepare them for the same offering of self that he so willingly provided, in love and in gratitude for all he was given. And believe me, he doesn’t want a present for that. What he wants is to know that all of that good stuff has been passed on, that it continues and grows and moves beyond his years to others. So this year, give him what he deeply desires, by supporting a nonprofit “Fatherhood Initiative” . Fatherhood is not DNA encoded. It is not something every boy is born knowing, and sadly many do not experience in their short lifetime. But it CAN be learned. And it CAN be shared. And it will live on through the noble work of these organizations and more. Here are some to get you started. And when you give, give generously as Dad did, from your need, not your excess. And then say Thank You Dad. Continuing our series on Corporate Philanthropy, we take a look at what the key behaviors are that we see in nonprofits who have developed partnerships that provide a strong, reliable and renewable revenue stream? 1. They all have a Personal Relationship with the company leaders: As a personal investment, the requirement that we build meaningful dialogue and a unified voice in our efforts to identify opportunities for partnering is essential. A relationship with our company partners is not a mail campaign. It’s not a sponsorship pitch. It is the same level of personalized cultivation applied to our individual major donors. Getting to a partnership is a process. The flow from first connection (usually a gift of some sort) through partnership generally follows this route: Transaction —–> Relationship—–> Information——> Partnership. The relationship traditionally begins with a transaction of some sort: a sponsorship, a membership, a donation, a grant. Capturing the interests of the corporation and appropriately acknowledging and stewarding their generosity, a relationship is developed, where information is shared that further delineates the opportunities and shared values/goals of the two parties, which leads to a partnership. It’s essential that you get comfortable with building personal relationships for funding or partnerships with your corporate donors. It’s crazy to even have to say that, but many fundraisers we have worked with are intimidated or lack dedication to the relationship building process. Having a personal relationship with your corporate donors is the most important thing you can do to succeed. 2. Value proposition: Your Value Proposition is a definition of the key benefits you provide to the corporation, as a potential partner. Your client base, your donor market, your organizations core values, where do you operate, what is your brand, who do you influence? These are value positions used to negotiate what is needed- cash, people, advocacy. Your Value Proposition is not what you do. Let me say that again: VALUE PROPOSITION does NOT equal WHAT YOU DO! As evidenced in some of the past video and case examples, Nike and others did not partner with the chosen NPO’s because of what they did. What they did was important. And the outcomes were essential to the decision. But the value proposition of those organizations was the quantitative factors they bring to the table: who do they reach? who gives to them? where are they located? what community do they serve? What does their organization represent to the community? Taking a value inventory will be critical. You can do this internally amongst your staff in a brainstorming session, or you can hire a facilitator to help in the process. Either way, having a very solid knowledge of your value proposition is essential to successfully identifying and selling your organization to the right corporation for the right partnership. 3. Trust: This is huge. We think we know about trust, but in this sense we mean total and complete transparency, clear communication, and fulfillment. Trust is built slowly over time, as a friend recently reminded me. Its not an all or nothing position and it is only bestowed upon you or anyone incrementally with some consideration and time. It is also impermanent, it can change with the tide. Your organization must provide the framework within which that trust can be built with the corporation. It may mean sharing challenges that you normally would not be compelled or comfortable in sharing about your programs and funding. If it knocks you out of the competition for the companies attention, so be it; better to have it done now, than after you have spent considerable time, resources and energy in building up the relationship. Trust also requires promises to be fulfilled. If you said you would do something with the funding, well you better have at it and show the results. Things do happen that not goals off course or missed, but the frequent and candid communication you are engaged in, while building trust with your corporate partner, will have taken that into account. 4. Commitment: You know what they say- In breakfast, the chicken is involved, but the pig is committed. Your commitment to long term strategies requires your organization to have a vision and a strategic direction. Commitment is not chasing the money; it is building on and resourcing the programs and services essential to your success. Nonprofits who have successful corporate partnerships have mission strategies that are imbedded in their DNA, they are clear and concise and tactical. They are committed to the outcomes, no matter what. Following these four foundational behaviors will position your organization to be prepared for a myriad of corporate funding partnerships that provide long lasting benefits and outcomes. NEXT POST: Developing a plan for your own corporate partnership program. What do Companies want from their Corporate Giving? While a market presence and position is always a number one consideration for business, as they play out their social responsibility in the community, it isn’t necessarily the only factor behind their engagement. It’s important we are aware and respectful of all the driving interests, if we are to develop winning corporate partnerships. McKinsey & Company, a 75 year old management consulting firm which serves over 70% of the Fortune 500 companies listed today, surveyed 721 executives around the world—74 percent of them CEOs or other C-level executives, about corporate social responsibility. You can find the complete report here. In their survey, McKinsey found that the vast majority of companies surveyed—nearly 90 percent—seek business benefits, such as customer acquisition and product distribution, from their philanthropy programs. And some 80 percent of respondents say finding new business opportunities should have at least some role in determining which philanthropic programs to fund, compared with only 14 percent who say finding new business opportunities should have no weight. So, marketing drives philanthropic partnerships… well, not so fast. Remember “Bucketgate” May 2010? This drew much criticism and debate when it launched around Mothers Day. Poor KFC, while they thought the pink would bring them notoriety, they didn’t expect the kind they received. And while any press may be good press, this just didn’t make sense, in any remote fashion. And the consumer saw right through it. Sadly, Susan G Komens’ judgement and incentives were questioned as well. If business benefits are a leading factor in a company’s drive to develop NPO partnerships through their giving, and pink buckets of chicken are the anti-concept, what does a philanthropic/socially responsible partnership look like? Take a look at what might be a plausible and valuable brand and marketing position, from Nike. The Nike Foundation created the ‘Girl Effect’ with critical financial and intellectual contributions by the NoVo Foundation and Nike Inc. and in collaboration with key partners such as the United Nations Foundation and the Coalition for Adolescent Girls. Here is their introductory video. What business benefits might they be seeking in support of this cause? What new business opportunities are they building? How does this make sense? Not to be a KFC basher (I’ve eaten my share of chicken), but do we see the difference? This program does not appear to have the ‘slap it on a bucket’ approach of KFC. This philanthropic/socially responsible partnership ensures that market is not the key driver, but an integrated aspect of the partnership Nike has developed. Executives overall say their companies are much likelier to address a broad mix of local issues with their corporate philanthropy programs than to address the social and political issues that they expect will affect shareholder value the most. In addition, interviews conducted suggest that companies see addressing local community needs as an indirect way to highlight a company’s good intentions to groups such as board members, shareholders, and regulators. Chase Community Giving is an excellent example of a corporate giving program that was developed to have local impact. And in an interesting twist, Chase has combined their local perspective with crowd-sourcing: allowing the community to choose the charities which Chase will support. By having the community vote on their charity of choice. Chase is empowering their community to lead their philanthropy. What is interesting about this, is that it make a case for and support the concept of, nonprofit accountability. If your NPO is not relevant in your community, if your community does not know about, care about or support your work….if you’re not doing good work and reaching meaningful outcomes- then you’re not a contender for Chase philanthropy. Their vetting process for impact is knitted into their philanthropy program. Respondents in McKinsey’s survey most often cite employees as the stakeholder group important to the way companies think about their roles in society and as the group companies most often address with corporate philanthropy programs. Employee satisfaction, retention, recruitment, all are critical business factors to corporations. By aligning their philanthropy with their employee base interests, they develop efficiencies in both lines. Often a company will have employee driven efforts, special programs which only employees can access for philanthropic engagement, pooled funds from employee activities, volunteer efforts devoted to employee outreach to the community and more directed at the interests and activities of employee groups. The goals most often cited by corporations in their corporate giving strategies— 1. business benefits: enhancing brand, market reach; 2. working locally; and 3. building employee capabilities, improving employee recruitment and retention, all must be factored into the developed program you are building with your prospective corporate partner. If your program offers all three, its the trifecta of a corporate partnerhsip. Lets take a look at two award winners from the Committee Encouraging Corporate Philanthropy’s Corporate Philanthropy Day 2010. As you watch this, try to capture as many of the goals and key outcomes we just discussed, in the programs these two innovators have developed. Pretty comprehensive right? And I can guarantee these were not created in a marketing office, but were organically developed between the company body and the nonprofit they had the closest relationship with. And more importantly, why is it an important part of our conversation in discussing our relationship with corporate partners in philanthropy? The reality is that Corporate Social Responsibility is an emerging field. It is a very broad and evolving area of development for corporations and not for profits alike, a new terrain for which maps are much needed, but often are imprecise. It has a complexity that is only seen in the emergence of new ideas and systems , a nucleus of thoughts, practices and evidenced based studies that are lending to the defining structure that it is becoming, following along the lines of chaos theory. To a corporation, Corporate Social Responsibility (CSR) has a multitude of components, too many to review in this one small post. Its concept and its practice is complex, often disjointed and, currently, most often reactive. Divergent views and information overload is nowhere more apparent than in the field of corporate social responsibility. Each company is different, each with its own challenges, corporate culture, unique set of stakeholders and management systems. Each with its own view and opinion and strategy. Two very nearly similar definitions. We are getting close to a commonality of expected beliefs and outcomes, among everyone involved in defining CSR. External Business Practices: How the corporation does business. Who they compete with, who they partner with, their supply chain, their products, their distribution lines and the impact their business has on society. Impact Partnerships: How they respond to societal issues that specifically impact their business practices, both internal and external and who they partner with in doing so. Secondly, most corporations will agree that the measurement of these are based on three bottom lines: Financial bottom line outcomes, Environmental bottom line outcomes and Social bottom line outcomes. This is called the triple bottom line. For our role, as nonprofits seeking to shift our approach in securing corporate funding, it is essential to know and understand the core concept, terms and definitions on CSR as outlined here. Our ability to engage in an educated dialogue about our partners corporate social responsibility is critical to our successfully defining a partnership that meets both our and their needs. Let me take you through a quick history on corporate social responsibility. Some may think it’s a new idea, a fad or a recent breakthrough in thinking. But it goes as far back as the late 1800’s. Evidence of corporate socially responsible practices among industrialized corporations can be found in some of our most familiar company names. For instance, take the Sears Roebuck Company, a company that was near bankruptcy when Julius Rosenwald, joined the company in 1895. During his tenure as vice president, treasurer and then president, Rosenwald grew the company from a failing $750,000 a year corporation to over $50 million. As part of his growth plan, Rosenwald invested a lot of Sears’ money into society, specifically agriculture. Rosenwald understood that the growth of Sears Roebuck was wholey dependent on the growth and wellbeing of the company’s customer- the American Farmer and its field hands. And so he invested in his company by investing in his customer, through their societal, educational and family needs. Why Rosenwald did this was not ‘termed’ corporate social responsibility until 1953 with the publication of the book ‘Social Responsibility of Businessmen’ by economist and college president Howard R. Bowen. But still the term languished, without much fanfare for about a decade, until the phrase was reinvigorated in the 60’s and 70’s around the time when big international companies faced anti-corporate sentiments because of environmental and human rights issues. In fact, companies faced large scale boycotts of their goods and services to force change among corporate practices affecting society and the environment. Through the 80’s discussion of the concept of CSR grew. During that time, most socially responsible behavior was positioned as a philanthropic activity based on a company’s fixed budget that was allocated to support nonprofit organizations – mostly doing so to “look good”. These funds were sometimes allocated to many organizations with the idea that to satisfy as many interest groups and to gain as much visibility as possible was a beneficial goal. The commitment was usually short term and restricted to making donations that were heavily influenced by the wishes of the senior management of the organization, and mostly to bring about a marketing position through brand awareness at nonprofit events. Then in 1989, Ben and Jerry’s distributed the first ever Social Responsibility Annual Report. People took notice, because it authentically calculated Ben and Jerry’s business practices and policies that lead to meaningful outcomes for society and the environment and to bottom line financial benefits to the company and the communities it supported. Academic exploration, corporate research and charitable interest in CSR began to escalate at a rapid rate. In 1992 the Earth Summit in Rio was a key moment in the evolution of CSR. At this Summit, it was reported that “the level of corporate involvement in the summit was unprecedented, unlike anything ever seen before, with a coalition of 48 companies coming together to establish a new coalition, the Business Council for Sustainable Development (BCSD)”. This coalition placed the academic and financial exploration of CSR culture on the map in a way now other group or company had been able to do before. The BCSD would later become the World Business Council on Sustainable Development (WBCSD) which continues to be an authority in CSR and have tremendous influence on the corporate social responsibility stage. Since that time, corporate social responsibility as an essential and important business practice has moved from discussion in the cubicles of most corporations, to a presence in the board room and a position on the balance sheet of almost all company’s large and small. In addition to the shifts and perspectives being discussed and implemented in the business academic world, we see advancement in environment surrounding business governance as well. ISO 26000 was implemented September 14 2010. For those not familiar, The ISO –a network of the national standards institutes of some 160 countries that develops and coordinates standards of operations for business lines. The standards govern management of Quality, Risk Environmental and now Social Responsibility. Simply put, these standards are applied to a company’s business practices, who actively engage in pursuing compliance. When they do so, they are awarded an ISO brand of approval for achieving and maintaining these standards. These are highly coveted and companies who achieve them make them visible. This is the first time an organized set of standards has been produced and disseminated for companies to follow. Thought leaders believe this will be game changing for companies in strategizing and developing their social responsibility. ISO 26000 is a response and a governance influence on corporations. IN part it may stem from the multitude of influencer’s outside the corporate circle. When JP Morgan Chase investors assemble to vote on a “Genocide Free” investing policy for the company, the pressure to conform and perform to standards is undeniable. Loss of trust by the consumer, civil society activism and Institutional investor pressures, all bear significant influence on corporations today. Corporate philanthropy has seen some radical shifts in the last twenty years. We may just now be drawing concern about what is happening, where it is headed and how do we stay engaged as these changes evolve? To understand the shifts as they appear, we need to look at some key factors, one being influences on the corporate sector. Let’s take a look at thought leaders in business and how their rockstar status and larger than life influences have impacted the patterns we are experiencing with corporations as they support causes and charitable efforts. No conversation about corporate giving could be complete without a reflection on the impact of Milton Friedman. Milton was a Nobel Prize winner in economics. He was a distinguished professor at the University of Chicago. He was the author of the classic best-seller Capitalism and Freedom and a long-time Newsweek columnist. 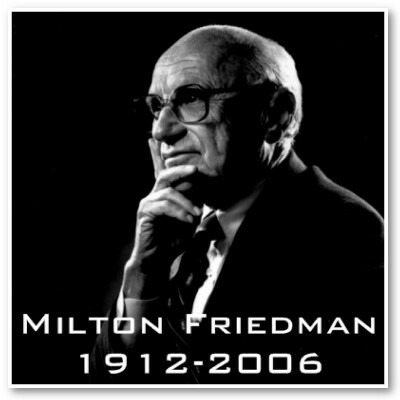 Milton Friedman was one of the greatest and most influential economists in the 20th century. This certainly qualifies him to be considered a business rockstar. He was also an unapologetic curmudgeon, an outspoken and controversial thought leader on all things business. He was vehemently against corporate social responsibility as an obligation of business. He held that giving by a publicly held corporation in the name of “social responsibility” was a form of theft. But Friedman was not against all corporate giving. Corporate philanthropy could be justified if it served a business objective—improving employee teamwork and motivation, strengthening the marketing of a company’s brand, enhancing financial outcomes. He also had a less emphatic position on giving by privately held companies. He thought that was a decision best based on the individual or family owning the company, as it was their money to give away. 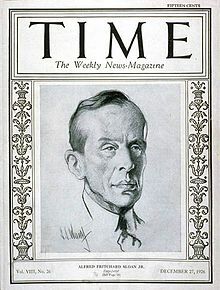 Alfred P. Sloane, another uber-chief of corporate discipline, he was born in New Haven Connecticut, educated at MIT and graduated from there in just three years, as the youngest member of his class. Alfred was a long time President and CEO of General Motors, resigning to remain as their board chair until the late 1950’s. He steered the corporation through some tenuous and deadly years of bad business, Nazi allegations, and revenue slumps. He was not as eloquent a man as Milton, but he too felt philanthropy had no business being tied to business. He simply stated “The business of business is business.” And like Milton he was a prolific philanthropist. Because of his personal generosity, his name today is on buildings and foundations across the nation, from Sloan Kettering in New York City to the Alfred P Sloan Foundation, whose assets currently reach about 1.8 billion dollars. Why is it important to have knowledge of these two giants of industry? Why should we abandon our cynicism and try to comprehend their position on corporations and giving? Because every MBA student leading or preparing to lead companies today, have at their hearts, minds and training, the words, vision and example of Milton and Alfred. And it is with this training today, that they are approaching the development of corporate giving strategies. The apparent disunion in the perspectives of these two gentlemen, when it came to business and philanthropy, is at first perhaps perplexing. But it is not unusual. Their beliefs still hold true today. Whether you agree or disagree with their perspectives, these men continue to have tremendous influence on the culture of business through their legacy. PFSK, a trend research firm in New York, found an interesting cafe in Japan. I was turned onto this story by a blogging friend. The Japanese cafe, called Ogori, has a unique service proposition. You can order anything you would like. But you are served what the person in front of you orders. And so the person behind gets what you ordered. And their order goes to the person behind them. And so forth. If this were the consequence of all of our decisions, how would you order? Pay it forward or social revenge? Now imagine your donors. If what you ordered went to them, what would you be leaving them with?